The pulse of rock’n’roll – the drummer – finally gets its due in this unique, all-encompassing inside look at the culture and history of drumming. Beating the hell out of a drum kit is hard, sweaty, demanding work. Yet instead of being showered with respect, drummers are often viewed with derision – stereotyped as crazy, borderline psychotic, or just plain dumb. But as every musician knows, to have a great band you need a great drummer: Ginger Baker. John Bonham. Chad Smith. Stewart Copeland. Neil Peart. For the first time, Tony Barrell shines a long-overdue spotlight on these musicians, offering an exciting look into their world, their art, and their personalities. In Born to Drum, Barrell explores the extraordinary history of the world’s most primitive instrument and the musicians who have made it legend. He interviews some of the most famous and revered drummers of our time – including Chad Smith, Ginger Baker, Clem Burke, Sheila E., Phil Collins, Nick Mason, Patty Schemel, Butch Vig, and Omar Hakim – who share astonishing truths about their work and lives. He investigates the stories of late, great drummers such as Keith Moon and John Bonham, analyzes many of the greatest drum tracks ever recorded, and introduces us to the world’s fastest drummer, the world’s loudest drummer, and the first musician to pilot a “flying drum kit” on stage. Filled with fascinating insights into the trade and little-known details about the greats, Born to Drum elevates drummers and their achievements to their rightful place in the culture of the world. BORN TO DRUM is largely sold out, but you may be able to obtain a copy on eBay. 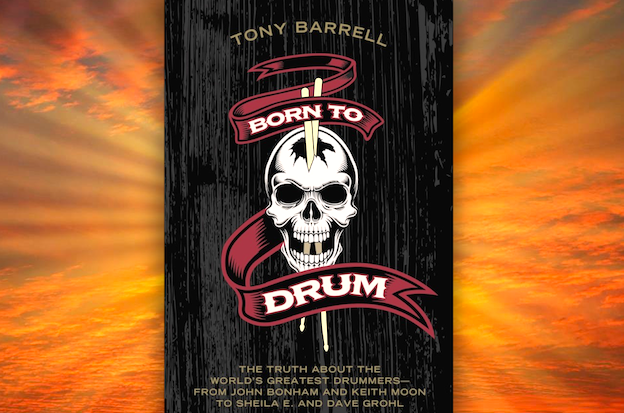 Share the post "BORN TO DRUM"
The best book about drums, drumming and drummers that I’ve ever read. Thanks for writing it. I’ve just bought 18 copies to give as Xmas gifts this year! What an entertaining read! I loved all the stories and interviews in the book.